4. Science is not just for scientists. 1. How is risk information used by the populations it is meant to serve? 4. Oil palm plantations and Chagas disease: a new disease transmission scenario in Panama? Do vectors get sick too? 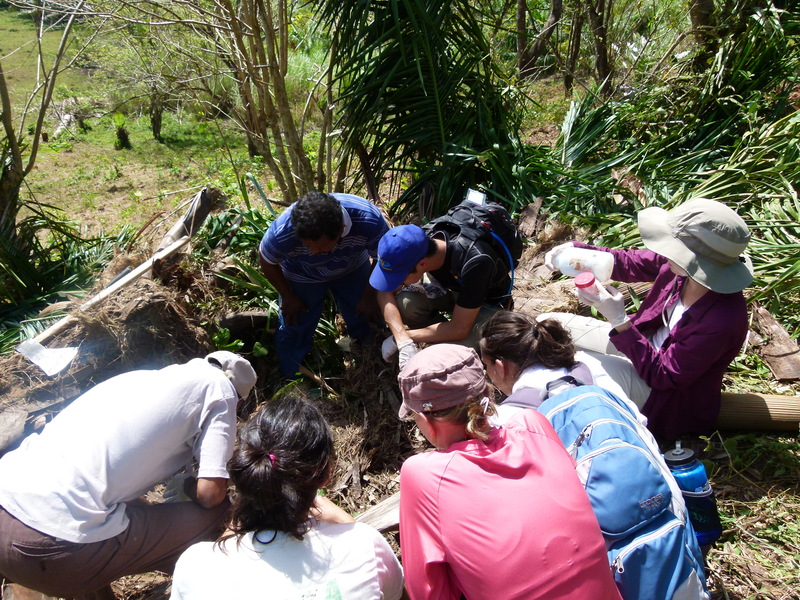 Students in Mompox, Colombia learning about Chagas disease biology. Photo: JK Peterson. When working with students, I often feel like a broken record, because I am constantly asking them, ‘what’s your research question?’ I believe that almost any issue can be solved by going back to the research question. Lost in your data? What’s your research question? Can’t figure out how to design your experiment? What’s your research question? Which graph to include in the paper? What’s your research question? How to structure your manusrcipt? What to cover in the introduction? What to discuss in the discussion? What to put in your powerpoint? You get the idea. I do not do science in a bubble nor to make me feel really smart. I was not a kid who took alarm clocks apart just to see all the pieces and then put them back together. (For the younger generation- an alarm clock was a small piece of machinery we used to help us wake up in the morning.) This is not to say that curiousity is not important (curiousity VERY important! ), nor that understanding the role of every component of a system is not important. However, in my work, every project I get behind must have the possibility, however minute, of having a positive impact on human society, conservation, the environment, or all of the above- even if it is just a drop in the proverbial bucket (as PhD theses often are- see below to read about my drop in the proverbial bucket). Over the past decade it has become common for NGOs and other global health institutions to survey an area for disease risk, and then create some kind of resource aimed to serve the population at risk, often in the form of a risk map. After this is carried out, the information is given to the population and the instution leaves, patting themselves on the back for a job well done. However, how is this information actually used? Is it used all? And if it isn’t used, is there a way to encourage its use? 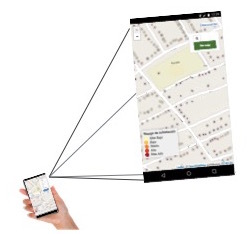 VectorPoint risk map as displayed in a cellphone screen. As such, we are currently comparing vector surveillance with risk information (i.e., using VectorPoint) to common practice, which is carried out using a hand-drawn map of an area and paper data entry forms. In current practice, the selectio of houses to inspect is carried out randomly, often in numerical order. We are investigating if this changes when they have VectorPoint to inform them of the infestation risk of each house. Will they incorporate the information into their select of houses to visit or will they go on selecting houses at random? 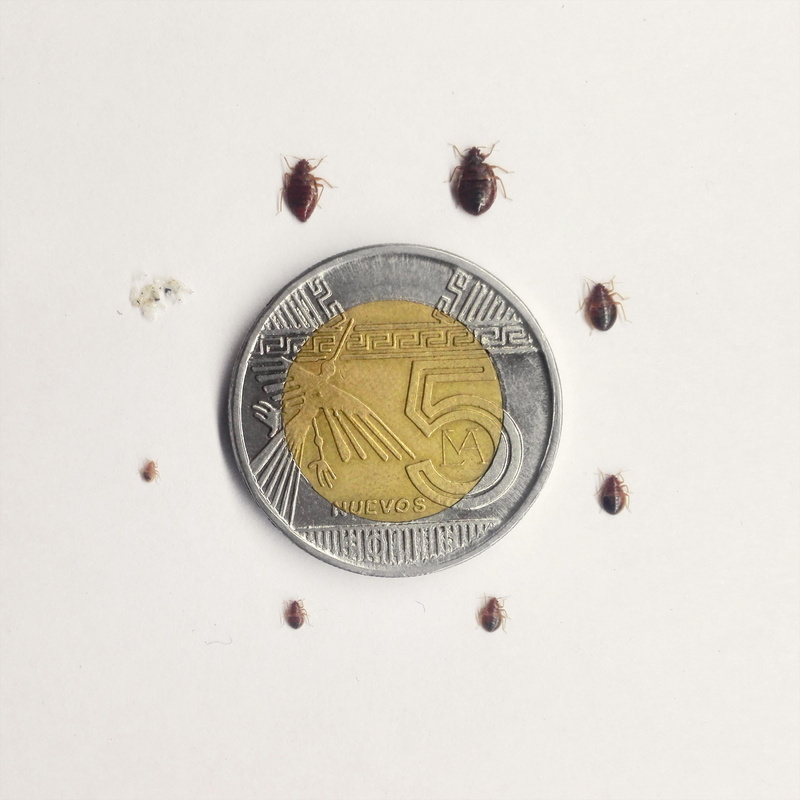 Although not currently implicated as a vector of human pathogens, the common bed bug, Cimex lectularius, has been suspected of carrying human pathogens due to its close association with humans and its hematophagous feeding style. Recently, we characterized the vectorial competence of C. lectularius for the parasite Trypanosoma cruzi, the causative agent of Chagas disease. We observed that C. lectularius can acquire T. cruzi infection when fed on T. cruzi-carrying mice, and subsequently transmit T. cruzi to uninfected mice. This led us to ask, why has C. lectularius not been observed to vector T. cruzi outside of the laboratory? 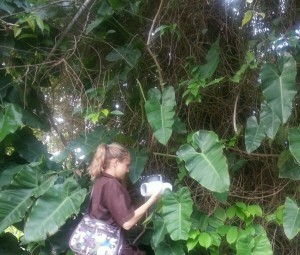 We hypothesized that T. cruzi reduces C. lectularius survival and/or reproduction as an explanation for why C. lectularius does not to transmit T. cruzi in natural settings. We tested this hypothesis by comparing the survival and reproduction of uninfected and T. cruzi-infected C. lectularius. We observed that T. cruzi had a variable effect on C. lectularius survival and reproduction. There were negligible differences between treatments in juveniles. Infected adult females tended to live longer and produce more eggs. However, no effect was consistent, and infected bugs showed more variation in survival and reproduction metrics than control bugs. We did not observe any negative effects of T. cruzi infection on C. lectularius survival or reproduction. Therefore we reject the hypothesis that T. cruzi decreases C. lectularius survival or reproduction as an explanation for why it is not observed to transmit T. cruzi in natural settings. This work is currently under review at the American Journal of Tropical Medicine and Hygiene. 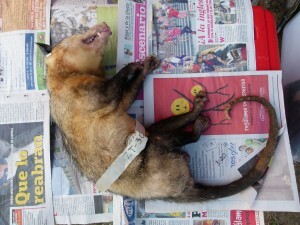 P. geniculatus female captured in Trinidad. Her proboscis is extended toward my thumb in hopes of a meal. Photo: JK Peterson. Currently, no islands in the Carribean are considered by the World Health Organization (WHO) or the Pan American Health Organization (PAHO) to be endemic for Chagas disease. However, triatomine bugs have been found on several Caribbean islands, and a handful of studies have found patients with infected with the Chagas parasite Trypabosoma cruzi. 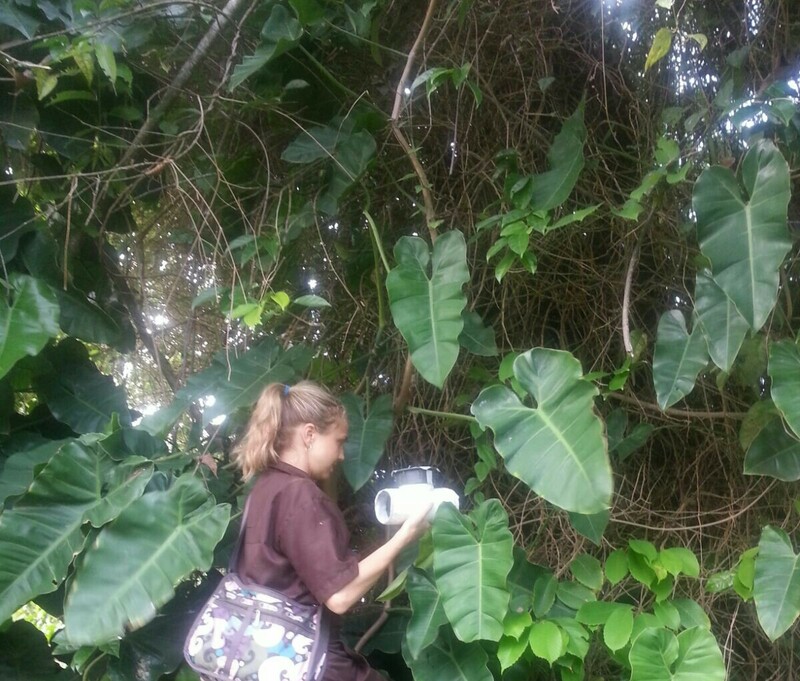 Therefore, in collaboration with Princeton student Alexandra Eakes and scientists from the University of the West Indies, and St George’s University, we carried out a preliminary survey on triatomine bug prevalence and feeding patterns in northern Trinidad. We found the species Panstrongylus geniculatus to be abundant in areas around human homes, of which over 80% were infected with Trypanosoma cruzi. In addition, blood meal analysis revealed that the majority of bugs were feeding on humans. 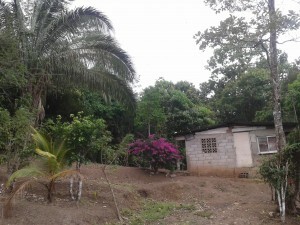 This project is currently being written up for submission to Memorias do Oswaldo Cruz. In the past 20 years, agroindustry expansion has facilitated infectious disease outbreaks on a global scale, including outbreaks of Nipah virus, avian influenza and most recently the Ebola virus. One of the most rapidly expanding crop types in the Americas is the oil palm. In this industry, the African oil palm, a non-native species in the Americas, is planted in large monoculture crops, and oil is harvested from the palm nuts. Opossum species Didelphus virginia undergoing xenodiagnosis for Trypanosoma cruzi infection. Photo: JK Peterson. 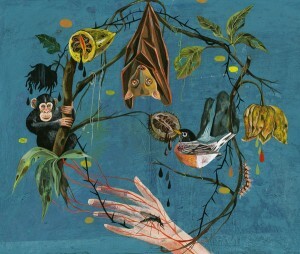 Often small, wild mammals such as opossums and bats, colonize the palms. Incidentally, these animals are also key hosts of Trypanosoma cruzi, the parasite that causes Chagas disease in humans. In Colombia, a study of African oil palms found kissing bugs in 47% of trees, 29% of harvested palm crops, and 41% of the bugs were infected with T. cruzi. If palm oil plantations in Panama were to have kissing bugs living in oil palms alongside small mammal species, all the components for a new Chagas disease transmission scenario would be in place. 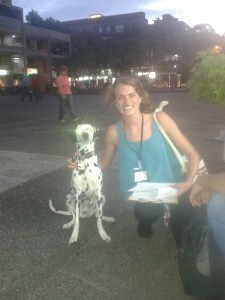 Along with collaborator Nicole Gottdenker from the University of Georgia, we were recently awarded an international seed grant to collect preliminary data to evaluate if large-scale palm oil plantations in Panama are creating a new Chagas disease transmission scenario. 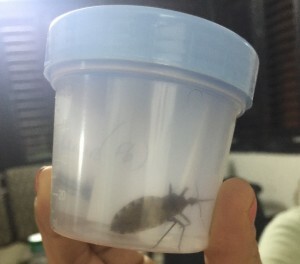 This could have serious repercussions on public health, as it brings the vectors into regular contact with humans working and living in and around plantations, and creates a hotspot of Chagas disease transmission. A classic Chagas disease transmission scenario where a royal palm tree lies within a few feet of a human home. The royal palm is the preferred habitat of the triatomine species Rhodnius pallescens. Photo: JK Peterson. As a Postdoctoral Researcher at Princeton University, I worked to develop mathematical models of Trypanosoma cruzi (etiological agent of Chagas disease) transmission as part of the NTD Modelling Consortium, funded by the Bill & Melinda Gates Foundation. The aim of this project was to use quantitative analysis to assist the World Health Organization in meeting their 2020 goals for Chagas disease. In this work, we used a mathematical model to explore how animals that live around people (such as pets, livestock, and vermin) can increase or decrease transmission of T. cruzi to the people who live in their proximity. We found that animals slighty increase the speed of transmission to humans, but that transmission is still maintained in the absence of animals, albeit slower. For example, in a scenario with animals, nearby humans may get infected within 5 years, as opposed to 7 years without animals. This is an important finding, as some have suggested reducing animals as a way to reduce transmission. Based on our work, we disagree with this strategy, as animals affect only the speed of transmission, but not the ocurrence of transmission. To learn more, click here. My doctoral thesis was centered on how human pathogens affect their insect vectors. Every interaction between species occurs in a heterogeneous environment that presents countless contexts that shape the interaction over time and space. The consequences of these interactions can regulate populations, as they trickle down to influence the genes that an individual passes on to its offspring, and then, in turn, scale back up to influence the genetic and phenotypic composition of future populations. In my doctoral thesis, I sought to uncover how these principles play out in the interactions between an invertebrate vector of human disease and the disease agent it carries. Disease vectors are often considered in a context that is faithful to the word as it is used in physics, where the vector is viewed as public transportation that moves the pathogen between hosts, experiencing no consequences of parasite infection. However, vectors face the challenge of how to maximize individual fitness in a stochastic environment with limited resources just as all other species do, so why would they be exempt from the effects of being parasitized? 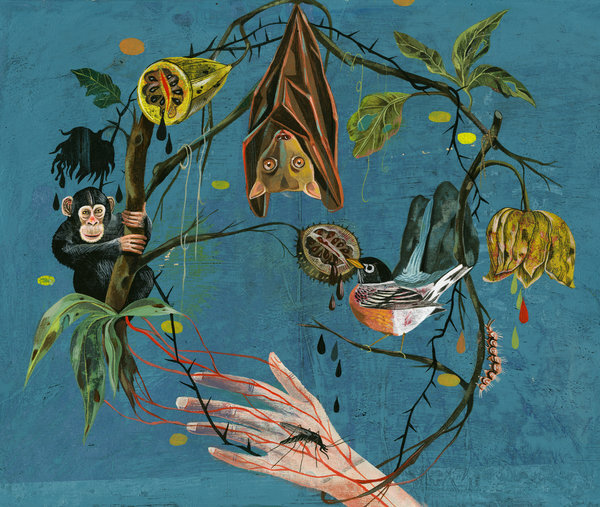 This illustration by Olaf Hajek is from a NY times piece on the ecology of disease. As such, I investigated the triatomine bug species Rhodnius prolixus when infected with the parasite Trypanosoma cruzi (etiological agent of Chagas disease), and co-infected with T. cruzi and its sister species, T. rangeli. I asked, does T. cruzi affect R. prolixus fitness, and under what contexts does this effect vary? I found a large range of variation in R. prolixus fitness when infected with T. cruzi, with the outcome being influenced by parasite strain, co-infection with T. rangeli, parasite dose, and the timing and order of infection. These factors did not act alone, but seemed to be dependent on one another: it was better to have a co-infection at lower T. rangeli doses, but at high T. rangeli doses, it was better to be infected with T. cruzi first, suggesting an interaction between dose, order and timing. These results illustrate the interactions across scales of both biological and spatio-temporal complexity that can be revealed when studying infectious disease through an ecological lens. Moreover, this work emphasizes the importance of taking into account the ecology of vector-borne neglected tropical diseases such as Chagas disease. Alexandra Eakes, Princeton Undergraduate Senior Thesis. 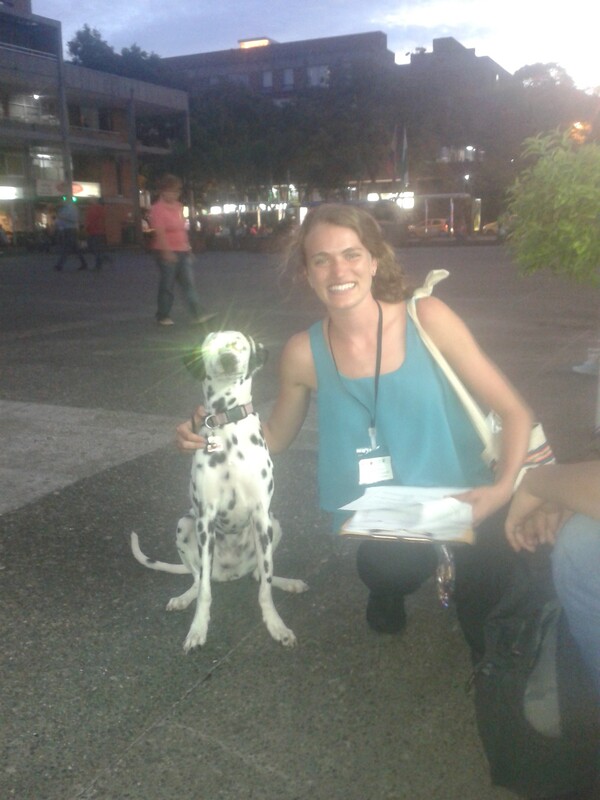 Roberta Hutton taking a break from carrying out health surveys in Medellín, Colombia. Ryan went on to spend a year as a Princeton Fellow in Africa, working in the public health sector in Lisotho, and is now working at OpenBiome while applying to medical school. Lauren is now a graduate student in the Meyers Lab at the University of Texas at Austin working on disease modelling. I am always looking to form new collaborations. If you have an idea of something you’d like to work on together, please contact me at jenni.peterson@gmail.com. Setting Noireau traps to collect triatomines in Trinidad.